This NebGuide discusses the advantages of compost, compostable materials, creating and maintaining a compost pile, and uses for compost in the landscape. Compost is a mixture of partially decomposed plant material and other organic wastes (Figure 1). It is used in landscapes and gardens to amend soil and fertilize plants. The chief advantage of adding compost is its ability to improve soil structure. Adding compost to heavy clay soil improves drainage by improving soil structure. Compost also absorbs water and improves the water-holding capacity of sandy soils. To conserve moisture or develop a xeriscape, a landscape requiring little water, it is essential to have soil with good water retention. In addition to improving soil structure, decomposing compost will slowly release plant nutrients, however, unless applied in very large amounts compost will not provide all the nitrogen that highly productive crops require. Organic gardeners can supplement generous compost applications with manure to produce good yields without the addition of other non-organic fertilizers. Making and using compost allows the gardener to recycle kitchen, home and garden wastes, and reduce the burdens of trash disposal. Almost all organic materials will decompose, but not all organic materials belong in the compost pile. Yard wastes, such as leaves, grass clippings, straw, and non-woody plant trimmings, can be composted. The predominant organic waste in most backyard compost piles is leaves. Grass clippings can be composted; however, with proper lawn management, clippings do not need to be removed from the lawn. If clippings are used for compost, it is advisable to mix them with other yard wastes. Branches, logs, and twigs greater than 1/4 inch in diameter should be put through a shredder/chipper or cut up with a corn knife prior to placement in the compost pile. Kitchen wastes such as vegetable scraps, coffee grounds, and eggshells may also be added. Egg shells do not contribute either nitrogen or carbon, but will decompose. Sawdust, wood chips and newspaper, which are very high in carbon, can be added. Provide sufficient nitrogen materials, or use commercial nitrogen fertilizer to balance the high carbon ratio. Approximately 1 pound of actual nitrogen (6 cups of ammonium nitrate) is required for 100 pounds of dry sawdust. Blood meal can be used as an organic source of nitrogen, instead of commercial fertilizer for organic gardeners. Blood meal is approximately 13 percent nitrogen so about 7.6 pounds is needed to provide 1 pound of actual nitrogen. Certain organic materials should not be used to make compost because they may pose a health hazard or create a nuisance. Meat, bones, grease, whole eggs, and dairy products should not be added because they can attract rodents and other wildlife. Most plant disease organisms and weed seeds are destroyed during the composting process when temperatures in the center of the pile reach 140° to 150°F. However, in most compost piles, it is impossible to mix efficiently enough to bring all wastes to the center. Consequently, large amounts of weed seed or diseased plants may create problems after the finished compost is added to the garden (Table I). Wood ash is approximately 25 percent calcium carbonate, a common liming product. It is highly water soluble, so it quickly affects compost pile chemistry. Adding too much will raise the compost pile’s pH and result in decreased microbial activity. 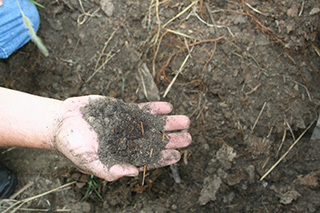 Use wood ash sparingly in the compost pile, particularly if the pH of your garden’s native soil is already alkaline. Finally, do not add manure from dogs, cats, pigs or any other type of livestock if the compost will be used in the vegetable garden. Bacteria and parasites that commonly infect these animals could survive the composting process and be ingested with the vegetable garden produce. All living organisms are made of large amounts of carbon (C) combined with smaller amounts of nitrogen (N). The balance of these elements in an organism is called the carbon-to-nitrogen ratio (C:N). This ratio is an important factor determining how easily bacteria can decompose organic waste. The microorganisms in compost use carbon for energy and nitrogen for protein synthesis. A ratio of about 30 parts carbon to 1 part nitrogen is the ideal proportion of these two elements for bacterial growth. Given a steady diet at this 30:1 ratio, bacteria can work on organic material very quickly. Most materials available for composting don’t have this ratio. So, to speed up composting, the numbers need to be balanced. For instance, a mixture of one-half brown tree leaves (40:1 ratio) could be used with one-half grass clippings (20:1 ratio) to make a pile with the ideal 30:1 ratio. This will work best on a weight rather than volume basis. Mixing materials of different sizes and textures also helps to provide a well-drained and well-aerated compost pile. The C:N ratios listed in Table II are only guidelines; they are not accurate for every material of that type. For instance, brown grass clippings from a poorly kept lawn will have far less nitrogen content than lush green clippings from a fertilized lawn. Likewise, the leaves from different types of trees vary in the C:N balance. The best way to become familiar with the balancing of carbon and nitrogen for a well-functioning compost pile is to be specific about it for a while. Think in terms of half high carbon and half low carbon material when building a compost pile. While this may not give the optimum C:N balance, it is a useful rule of thumb for those new to composting and not familiar with the materials. A pile that is too high in carbon will stay cool and sit a long time without breaking down. A pile too high in nitrogen will heat up fast, then quickly cool down and develop a smell like ammonia gas. Adding additional nitrogen or carbon materials, respectively, remixing the pile and adding more water will jump start the decomposition process again. To save space, hasten decomposition, and keep the yard looking neat, composting can be done in some sort of structure. 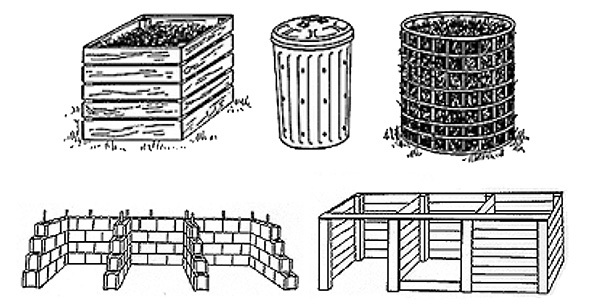 Composting structures can be made from a variety of materials, and be as simple or complex as desired. However, farm or acreage owners may prefer a free standing compost pile that can be mixed with a rototiller or tractor. Yard wastes can be composted either in simple holding units, where they will sit undisturbed for slow decomposition, or in turning bins, which produce finished compost in a month or two. Holding units are simple containers used to store garden waste in an organized way until these materials break down (Figure 2). A holding unit is the easiest way to compost, and is considered a passive composting system. It only requires placing wastes into a pile or bin as they are generated. Non-woody materials such as grass clippings, crop wastes, garden weeds, and leaves work best in these systems. Decomposition can take from six months to two years The process can be hastened by chopping or shredding wastes, adding a mix of dry and wet materials, and maintaining proper moisture. Since yard and garden wastes will be added continuously, the stage of decomposition will vary from the top to the bottom of each compost pile. Generally, the more finished compost will be found near the bottom of a pile and partially decomposed materials near the top. Once the compost at the bottom of a pile is finished, it can be removed and used, leaving the partially decomposed materials in the holding unit until they have completely decomposed. Turning units are typically a series of bins used for building and turning active compost piles (Figure 2). A turning unit allows wastes to be conveniently mixed for aeration on a regular basis. This speeds composting by providing bacteria with the oxygen they need to break down materials. Turning systems require frequent maintenance and preparation of the wastes to be composted. Figure 2. Holding units, such as those in the top row, work well for passive composting. A series of turning units, such as those in the bottom row, make turning compost easier. Figure 3. Multiple units make turning more convenient and speed composting. Composting in these units is most efficiently done in batches. Materials should be stockpiled until there is enough to fill the bin. These bins should be monitored and turned after temperatures have peaked (90-140°F) and begun to fall (Figure 3). This occurs four to seven days after pile construction. Turn a second time when the temperature peaks again, four to seven days later. Compost processed this way will be ready in four to six weeks. The compost pile should be located close to where it will be used and yet not offend neighbors. The pile will do best where it is protected from drying winds but in partial sunlight which helps heat the pile. Keep the pile near a water source so that adding water doesn’t require dragging a lot of hoses. The goal of composting is to create a beneficial environment for the growth and activity of aerobic bacteria. They require a minimum of 5 percent oxygen in the pile, but break down organic materials much faster than anaerobic bacteria and don’t generate any odor. Anaerobic bacteria live and grow in environments with less than 5 percent oxygen. They break down materials much slower and generate methane gas, which give some compost piles their rotten egg smell. Compost piles with too much water may switch from aerobic to anaerobic composition, and require the addition of more carbon materials followed by turning of the pile to stop the activity of the anaerobic bacteria. A compost pile should be large enough to hold heat and small enough to admit air to its center. As a rule of thumb, the minimum dimensions of a pile should be 3 feet by 3 feet by 3 feet (1 cubic yard) to hold heat. The maximum to allow oxygen to the center of the pile is 5 feet tall by 5 feet wide and as long as you wish. Microorganisms can only use organic molecules dissolved in water. A moisture content of 40-60 percent provides adequate water without limiting aeration. The “squeeze” test is an easy way to gauge the moisture content of composting materials. The material should feel damp to the touch, with just a drop or two of liquid being released when the material is tightly squeezed in the hand. 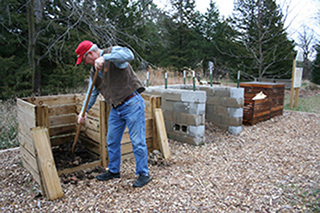 The compost pile can initially be prepared in layers. This will facilitate decomposition by insuring proper mixing. Layer 1 — Add a 4-6 inch layer of high carbon organic material (leaves or garden waste) which should also be damp. Layer 2 — Next, add a 3-4 inch layer of low carbon organic material such as grass clippings. This material should be damp when added to the pile. Layer 3 — On top of this, add a 1-inch layer of garden soil or finished compost. This layer will introduce the microorganisms needed to break down the organic matter. Mix Layers 1 to 3 (low carbon organic matter, high carbon organic matter, and soil) before adding another layer to the pile. This will ensure a speedy and even composting of the organic matter. Repeat the “layering” process until the composting bin is filled. For the passive compost pile, nothing more needs to be done. Eventually the materials will break down, but remember that it may take from six months to two years before finished compost can be harvested from the base of the pile. For the active compost pile, maintenance will involve turning the pile and adding water to maintain conditions conducive to the composting process. In an active compost pile (Figure 4), the temperature will increase rapidly and soon reach about 110°F. After about a week, the pile should be opened to the air and any compacted material should be loosened. Then the pile should be reconstructed; material previously on the top and sides of the pile should be moved to the center. 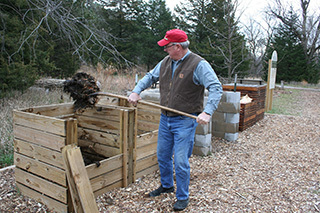 Steps to maintaining an active compost pile. Blend moist “green” and dry “brown” materials. Turn or aerate the pile periodically. Figure 4. Mixing and turning compost every 7-14 days results in the quickest decomposition of organic materials. After about another week, the material on the sides of the pile should be turned back to the center. Each time the material should be turned back to the center of the pile. At each turning, the moisture content should be checked using the squeeze test. Add water as necessary. The compost will be finished when the pile cools off and decreases to about one-third of its original volume. It will look like dark colored soil, with no recognizable pieces of the original materials. Finished compost is dark brown, crumbly and earthy-smelling. If small pieces of leaves or other ingredients are still visible, the compost is only partially decomposed. Allow partially decomposed compost to break down further, or screen out the larger, undecomposed pieces before using the compost. Put the screened materials back into a new compost pile, and give them more time to decompose. Adding large amounts of partially decomposed compost to the soil can reduce the amount of nitrogen available to plants, as the decomposing bacteria utilize soil nitrogen. This may restrict nitrogen availability to plants in the garden. If necessary, add extra nitrogen (such as manure or commercial fertilizer) to ensure that growing plants will not suffer from a nitrogen deficiency. Soil Mixes — Stable compost can be blended into soil mixes and is suitable for use in containers, raised beds and ground beds. It is typically mixed with other ingredients such as peat moss, shredded bark, sand, or loamy topsoil. Mixing ratios vary; but 10 percent compost is considered to be a minimum, 30 percent optimum, and 50 percent maximum. No more than 50 percent compost should be used in soil mixes, as decreasing plant growth may result. Stable and cured compost has its greatest value when rototilled directly into the soil. One cubic yard of compost covers 108 square feet at 3 inches, 216 square feet at 2 inches, and 324 square feet at 1 inch. The rule of thumb is to spread compost no more than one-third the depth of the rototiller. A 1-inch layer of compost should be tilled in 3 inches, a 2-inch layer tilled in 6 inches, and a 3-inch layer tilled in 9 inches. Making two or more passes with the tiller helps blend the compost with the topsoil and break up any clumps of material. Mulch — Compost can be used as a mulch around trees, shrubs, ornamentals, and vegetables. The author would like to acknowledge the contributions of Donald H. Steinegger, former UNL Extension Horticulture Specialist, and Don Janssen, UNL Extension Educator, who co-authored the first edition of this publication.